The pine-covered hilltop setting of their studio provides John and Judi with a beautiful and relaxing environment to work in. Their property is adjacent to the Ozark National Forest, just down the road from the bike trails. John and Judi relish the peaceful location as well as the privacy and solitude that the home studio provides. 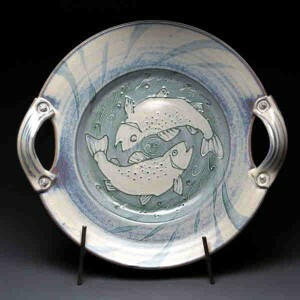 Both at their home studio and at the Ozark Folk Center, John and Judi produce and finish a variety of pottery. 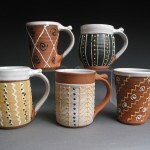 The bulk of their work is wheel-thrown functional ware decorated with liquid colored clay or “slip”. 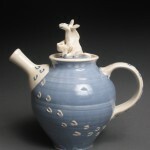 Their unique collection of slip decorated “Critter Pottery” is well know. A favorite item of that line is the “Critter Cup”. 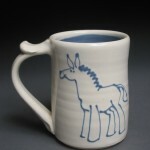 These are mugs decorated with line drawings of animals on the outside and little sculpted animals inside. 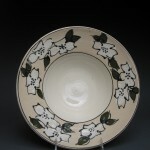 Another popular style of work is decorated with ferns imprints, and colored slip. 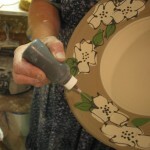 In addition to the wheel-thrown work, Judi also enjoys hand-building with clay. She uses their newly created space to sculpt animals and do figurative work. Recently she has begun to experiment with slab-built pieces as well. 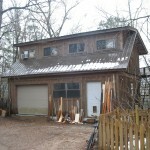 Although most of the work made in their home studio is fired in electric kiln on site, some of their work is fired in the Waste Vegetable Oil Kiln or the Wood-fired Groundhog Kiln at the Ozark Folk Center State Park. All of their functional work is microwave safe, oven proof, and dishwasher safe. Their pottery can be seen in a wide range of places. Judi has published five articles on wood-firing and slip decoration in professional pottery magazines: Ceramics Monthly, Claytimes Companion, and Pottery Making Illustrated. 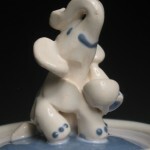 Their work is in the collections of Governor Beebe, Senator Hilary Clinton, and Senator Dale Bumpers. They have won awards at a variety of events. 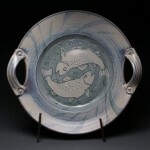 Judi and John are both members of the Arkansas Craft Guild Members and the Memphis Potter’s Guild. Fellow studio tour potters, David and Becki Dahlstedt were Judi’s mentors when she first came to the Ozark Folk Center in 1992. From the court house head east on 9/66 (toward Batesville) to the stop light by the Hardy’s. This is the junction of 5, 9, and 14. Take a right at the light and head north on 5, 9, 14. You will pass Walmart and other commercial areas and keep going. Once you will get out of town you will head down a long hill to towards the river valley. At the intersection at the bottom of the hill you will see Anglers Resort. This is where 9 and 14 split off to the left and right. Highway 5 continues North. Continue on 5 north. After about a mile you will pass Jack’s Boat Dock and Jo Jo’s Catfish House on the right. One half mile past Jack’s boat Dock is Green Mountain Road. It is a gravel road on the left hand side of the highway. There is a big sign for the bike trails on the right side of the road. Go ½ mile on Green Mountain Road and turn right at the burgundy mail box. Both 9400 and 9404 are on this driveway. The studio is in the right side of the garage. There is unlimited parking on the gravel road. However, parking by the studio is limited. There is room for 4 cars at a time. The walk from the road is about 2-3 minutes or so. We will have friend on hand to help tote purchases back to the road if need be. The studio is wheel chair accessible. The area in front of the studio is gravel but flat.